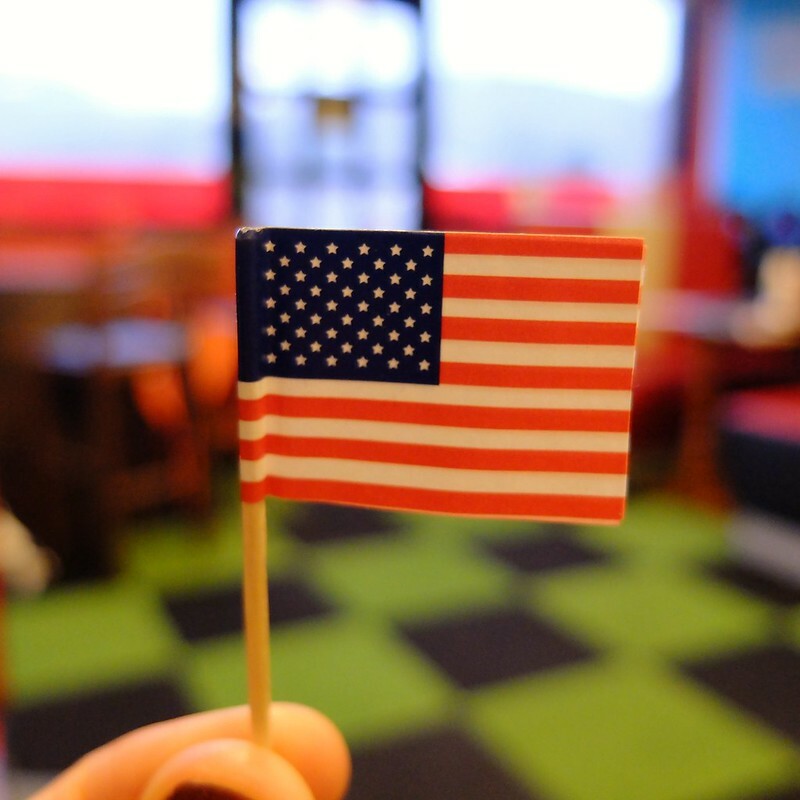 An American style diner has opened up locally, so we popped in last weekend to show it some support. 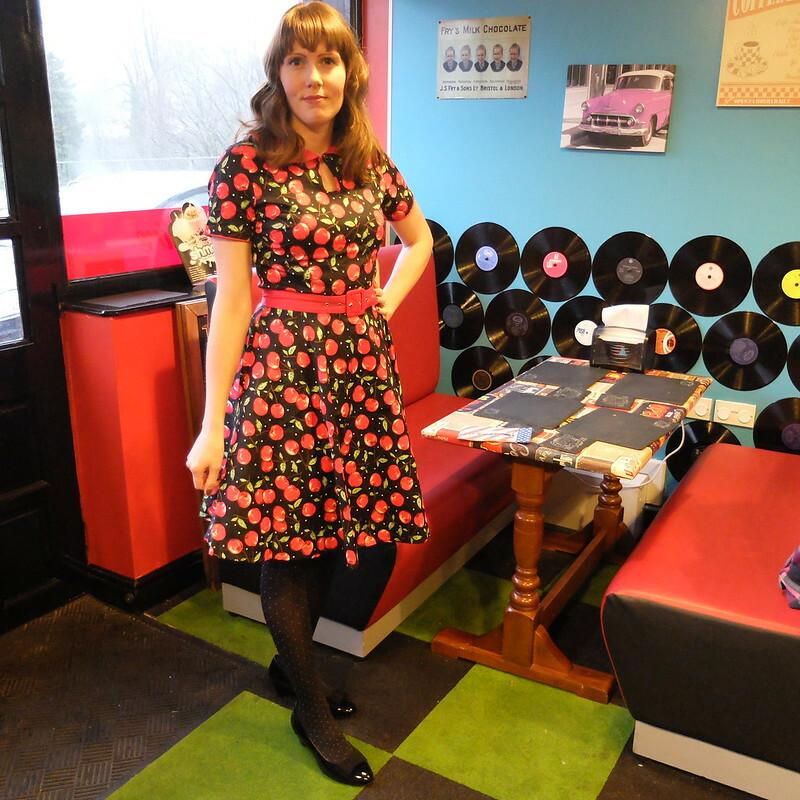 I took the chance to wear a dress from British dress company Dolly and Dotty. 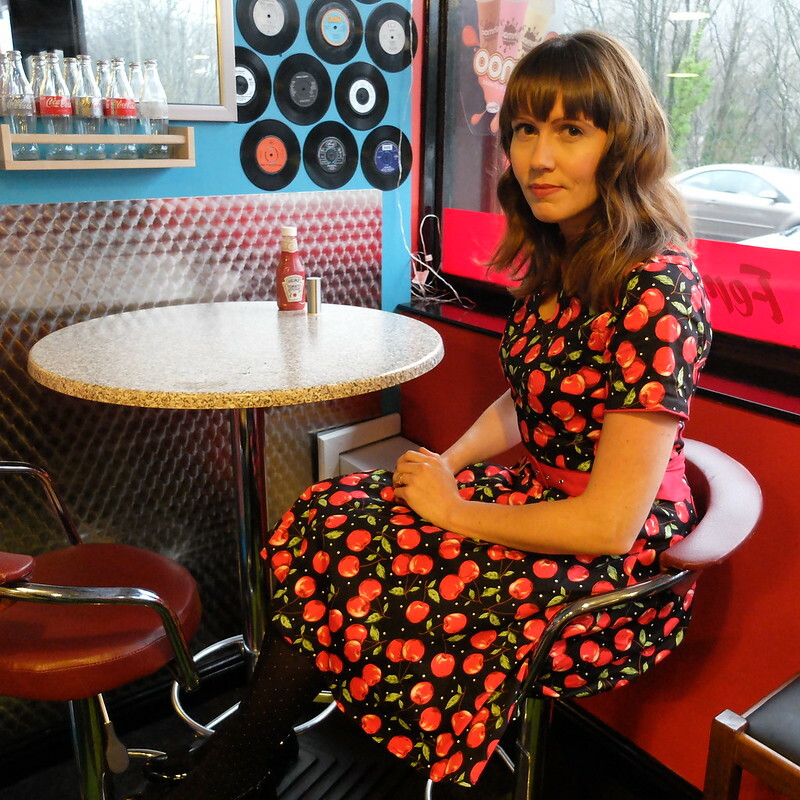 The dress is the 'Evelyn' style in a classic cherry print. I know a cherry print can divide people, as perhaps - like with gingham and polkadots - it has been over-associated with 'vintage', and done to death on everything from handbags to nail art. I have always loved fruit prints though (I already own at least two cherry print dresses, a handbag, and a jacket), and I'm not going to change my mind about it just because it's fallen out of favour. There are many levels to vintage style, from the somewhat cliched to the authentic, and with sub-groups such as pin-ups and so forth spinning off. I think there's something to love about it all. It was another grey, wet, and windy January day, with one difference - now it's cold too! The lighting was pretty awful, despite being the middle of the afternoon. Somehow it's made the cherries, belt and collar on the dress look a bit pink in all of these photos, but I can assure you that they are red. I've had a haircut too, with several inches lopped off, and it was my first attempt on this day to put a curl in my hair. The elements were against me, and most of the curl was blown out by the wind and rain that attacked me as I walked down the road. I'll keep trying. The dress is true to size, with a good fit, no issues there. The quality of the dress is also good - a nice medium-weight fabric that hangs nicely, and will see you through most seasons in the UK. I do like the contrast red collar, with keyhole, and the matching fabric belt. The belt is perhaps a little bit on the flimsy side, as it's wide, which means it has a slight tendency to fold over, but it's better quality than lots of belts you'd find on dresses in this price bracket (around £30) from other brands. On tall me, the length still hits below the knee. It's not as long as I would ideally like, but it's a very practical length and as such is a dress I would wear to work or on more casual days. It measures 22" from waist to hem, and my petticoats are 26", so I couldn't try it with one. The one thing I would change would be the back zip. In the last picture above, you can see that the zip doesn't go all the way up to the neckline, because of the collar which runs around the back. This means that when getting the dress on and off, you unbutton the keyhole at the front, and it's therefore a fairly small hole to get your head through. This makes it a bit tricky if you've already done your hair or make-up, as you risk either marking the dress or messing things up. 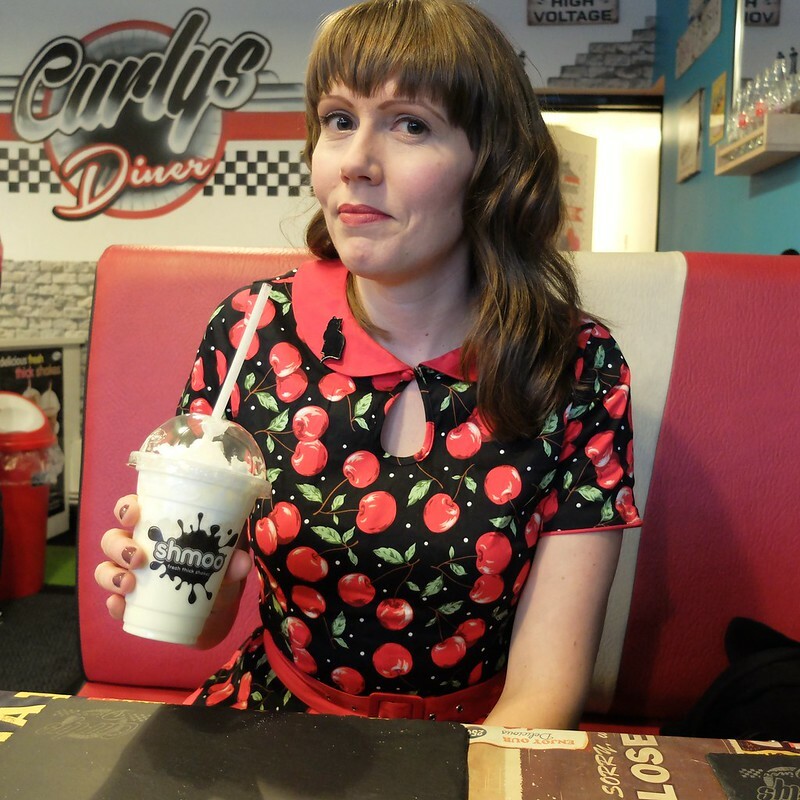 As for the diner – disappointingly the milkshakes are made from powder, rather than freshly made, and the burgers are pretty poor quality with a low meat content (what else is in there?!). It’s a shame, but we probably won’t be heading back there. To be honest, we make such good burgers at home that unless it’s a Jamie Oliver gourmet burger I’m not interested. Have you come across Dolly and Dotty yet? 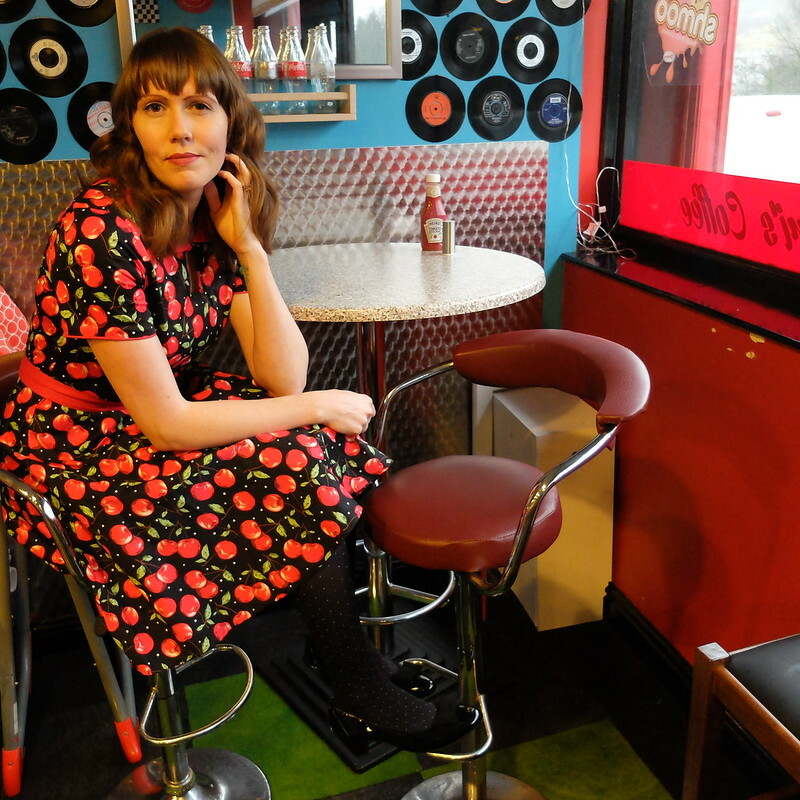 The 'Evelyn' dress by Dolly and Dotty is currently £29.99, and available in half a dozen different colours/prints. I was kindly sent the dress for review. All opinions and words are my own! Such a shame the food turned out to be a disappointment - if you're going to sell burgers, you better do it well as there's SO many of these restaurants out there now. Have you tried Five Guys? My favourite burger at the moment. It was Byron before that, but I feel like they've started really overcooking the beef and I can't STAND overcooked beef. Eh-hem, anyway. 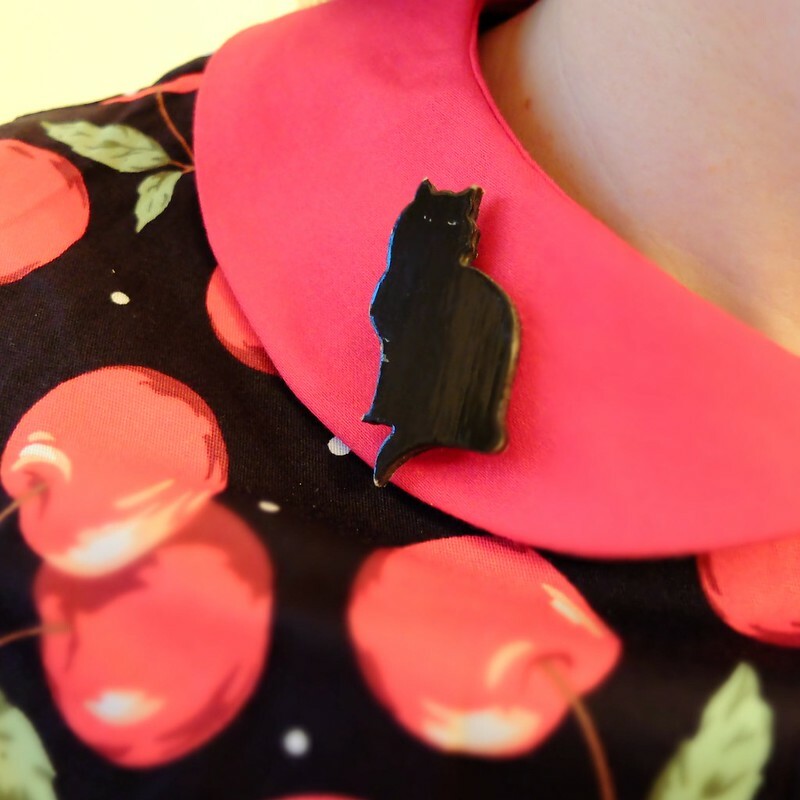 I know what you mean about cherry print - it does put me off owning such pieces now, if I'm honest. But then, I've never liked it all that much really and didn't own any pieces before it got overly 'done' - give me a strawberry print any day ;) or even polka dots, I think I prefer them. I haven't tried Five Guys, but we have one in Cardiff apparently! One to try for a girly lunch one day I think, I'll let you know what I think. I do think myself quite the burger expert these days, as it's something we make at home regularly. We even used a mincer once to grind up chunks of beef, it was quite gruesome and I felt like I should be singing Sweeney Todd. There are a few D&D dresses that I think have 'you' stamped on them, I'm going to place a bet now as to what you pick and we'll see if I'm right..! Got Beef is the best in Cardiff :) I like the endless soft drinks possibilities in Five Guys and get a bit carried away with strawberry fanta... I do like the neckline on this dress. I've got a gingham dress from Dolly & Dotty and it is a lovely, heavy fabric and is below the knee which is prefect to wear with a petticoat. Much prefer it to Lady V which can be double the price. It's a shame when the restaurant does a good job on the decor and then a crap job on the food. I think despite the low lighting these photos turned out wonderful with the location. I love the dress on you and the print. The keyhole is a nice detail. This is the first I have heard of this brand. I will hav to give it a try. This piece is super sweet on you, quite a simple shape that lets the print do the talking. The print is super fun, I just never really got why vintage repro brands love fruit prints quite so much especially cherries. I must say I'm more of a lemon print girl than a cherry one. P.S. Homemade burgers rock!!! That dress is really gorgeous. Honestly, it took me a second to realize it was a cherry print so I don't think it really goes in the divisive over done category. Really lovely! What a shame about the diner! We're lucky in Trow, we have Dean's Diner (a chain, but jolly good) and Smokey's, a local indie that is absolutely outstanding. Hopefully you will find a better nearby diner. "There are many levels to vintage style, from the somewhat cliched to the authentic, and with sub-groups such as pin-ups and so forth spinning off." Oh, THIS. I don't feel as though I belong in any subgroups, but I do love the diversity of vintage, and try not to be a snob. You could never go wrong with cherries in my book P! Sorry to hear the food was not as expected. That dress is a perfect fit for you! I LOVE a good diner. Cute post! Wait, I'm confused - powdered milkshakes? Low meat hamburgers? I mean, say what you will about Americans, but our food is usually made out of... food, even if we eat a bit much of it. 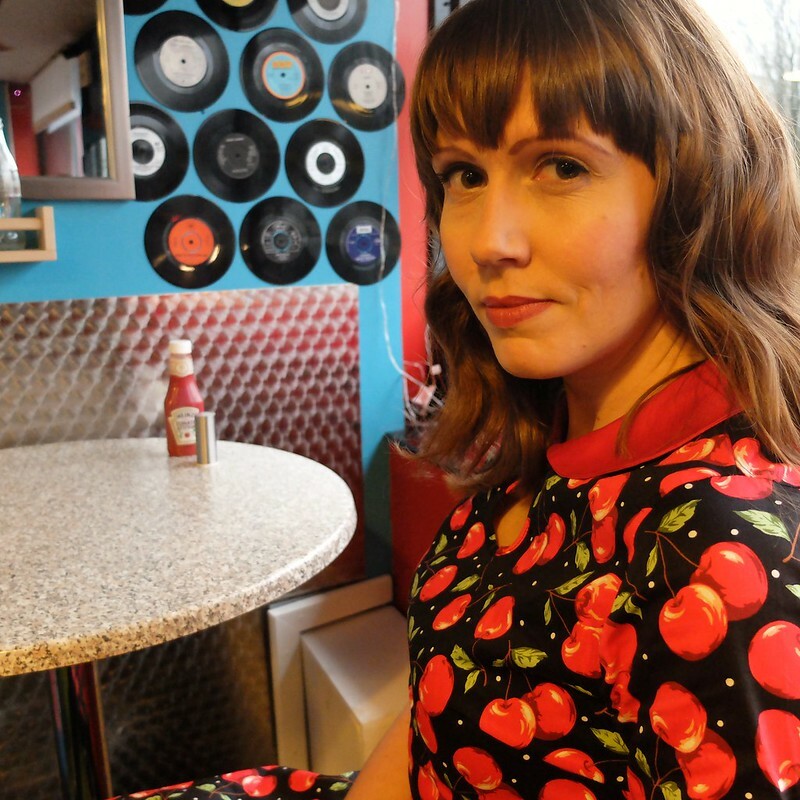 I do love the dress, though - the cherry print and peter pan collar are absolutely adorable. It's a really cute piece, and the diner is the perfect place to show it off. Sooo charmingly fun! Would you believe it, I don't own a single red and black cherry print dress or skirt. How such has eluded my vintage wardrobe for so many years is flat out beyond me (lol!). I really like how you talk about the different levels of vintage styles and how there's something to love about them all. So true! 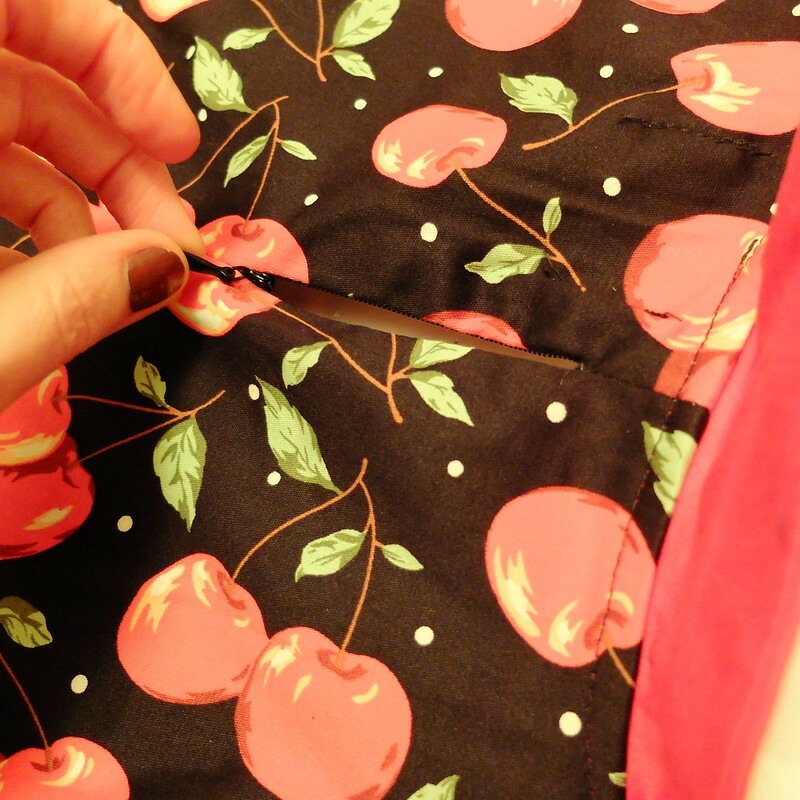 It took me a while to feel comfortable in cherry prints but I do love them! 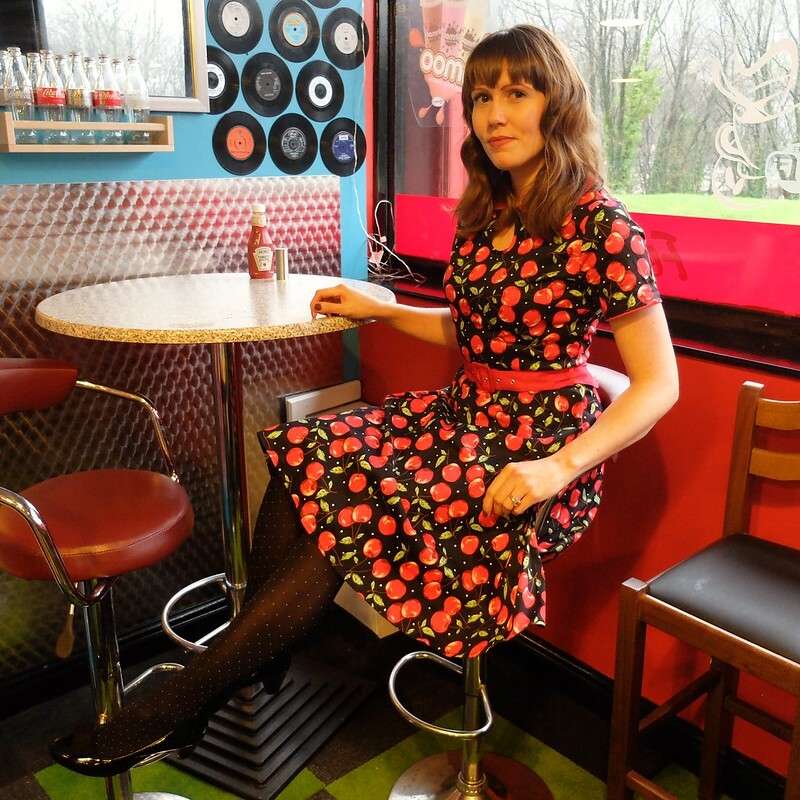 Such a cute outfit and perfect for the American style diner! It looks like a fun place. Sorry to hear that they fell short though in their drink and food offerings!